IT Specialists support computer and software systems, and communications networks vital to MAF’s operations. 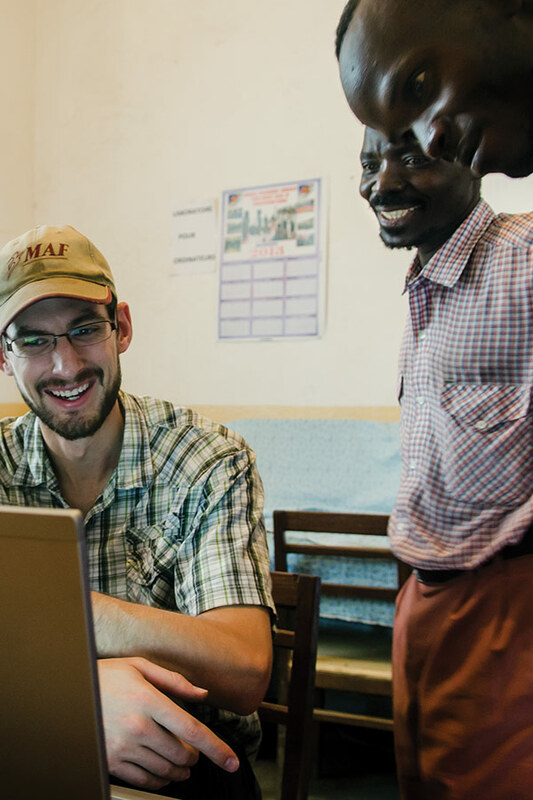 MAF Information Technology professionals help provide communications to relief and support staff around the world. Click here to complete a preliminary Information Technologist application. Click here to see how MAF is using IT Professionals. Click here for a list of IT professional needs within MAF. Click here to download a printable listing of current needs. You are at the sharp end of transformation as you work with our programmes in East Africa (Kenya, South Sudan, Tanzania and Uganda) delivering the technology platforms and infrastructure that keep our aircraft on schedule. You will need to inspire the team, work with department heads and local partners, to achieve the programme goals. You will ensure all operational activities in the programme are carried out within the approved annual budget by monitoring internal control systems and taking corrective action where necessary. You will also ensure that all operational activities of the programme are well coordinated with the heads of other departments within the programme. The ideal candidate will be educated to degree level or equivalent experience. They will hold an IT management qualification or have the equivalent experience along with excellent spoken and written English. They should also have experience of managing IT teams together with knowledge and experience of a variety of technical areas including Firewalls, Networking, Servers, Backup Systems, Security, Microsoft Systems, Active Directory, Server Virtualisation and Client Systems. be required, we also require that all applicants and their spouses (if applicable) . . . Considering a career with MAF isn’t like changing jobs here in Canada. The very nature of our work, and the places where we minister, require that all our candidates be qualified and up to the task. As a result, the process involved in applying with MAF as a career missionary can be a long one, so patience is a must. But if you’re serious about joining, this is a good place to start. First, in case you missed them, please take a moment to read our minimum standards and requirements for overseas service found above. This list is by no means comprehensive, but is designed to help you recognize if a career with MAF is right for you. If MAF is still where you want to be, let us know of your area of interest and qualifications, by completing a simple introductory questionnaire that gives us a chance to get to know you. To begin the application process, simply click on the appropriate link above, or speak with an MAF recruiter by calling our national office toll-free during regular business hours at: 1.877.351.9344. Please note that to join MAF-Canada, you must be a Canadian citizen and/or a permanent resident of Canada. IF YOU ARE NOT A CANADIAN CITIZEN and have reached this site from a country other than Canada but are still interested in pursuing a career with MAF, contact the MAF office nearest you (click here for a full listing). Additionally, before beginning the application process, you should click here to review our Statement of Faith.